Obituary – Edwards, David Gwin « Perry High School Alumni Association, Inc.
Football ’46-’49; Wrestling ’45-’46; D. E. Club ’48-’49. 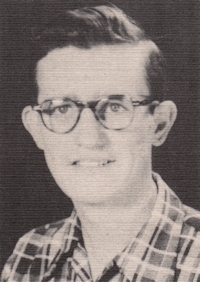 Lifetime Perry resident, David G. Edwards was born September 15, 1929 to Roy and Alma (Woodrum) Edwards. 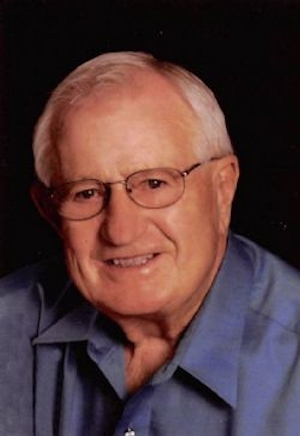 He passed away Sunday, September 13, 2015 at Green Valley Nursing Home in Perry at the age of 85 years. David graduated from Perry High School in 1949. After graduation, he enlisted with the United States Air Force from 1951 to 1953, where he served in the Korean War. On October 20, 1956, David was united in marriage to Janice Osborne and to this union, three children were born. David retired from Ditch Witch after 26 years. David was a member of the First Baptist Church in Perry. He enjoyed building engines, restoring cars, drag racing, swimming at the YMCA, and he loved his dogs. In his spare time David ran Edwards Auto Service from his home and enjoyed working on other peoples cars. David is survived by his wife, Janice Edwards of the home; two sons, Jeff Edwards and his wife, Sandra of Perry, and Joel Edwards of Perry; one daughter, Jill Hansen and her husband, Kevin of Perry; three grandchildren, Jesse Edwards, Jayde Hansen, and Lexi Edwards. He was preceded in death by his parents; four brothers, Steven, Robert, Thomas, and Donald Edwards; and one sister, Dorothy Berry. Graveside services are 2pm, Tuesday, September 15, 2015 at Grace Hill Cemetery Pavilion with Reverend Kim Hayes officiating. Memorials may be made to Alzheimer’s Association or First Baptist Church in care of Brown-Dugger Funeral Home, 1010 N. 7th, Perry, OK 73077.